One aspect of modern life that I believe remains underappreciated and unabsorbed is the fact that we now have free access to each others' cultures. Worldwide travel means you can pack a bag and be anywhere in the world in a matter of days. The Internet means you can not only talk to people thousands of miles away, but read the same books and news and see the same movies and TV shows that they do. I don't think we've even scraped the surface for the potential of cross-border cultural and linguistic melding. After 100 or more years of such cross-cultural sharing, what will our culture look like? Our language? Our children? In many ways, we stand at the precipice of a brave new world. Of course, this potential is also fraught with peril. One is cultural appropriation, in which artifacts of a culture are used as props by white people, who otherwise deride their use by actual descendants of the culture as "too ethnic" or "tribal". (Think dreadlocks.) The other issue gaining hordes of attention lately is whitewashing, where great stories are adapted from Japanese and other cultures, but the characters and settings are "whitened" to appeal to the US demographic, with much of the story's cultural uniqueness lost in the process. Both the US movie adaptation of Ghost in the Shell and the horrific Netflix adaptation of the wonderful anime series Death Note garnered loud boos from the anime fandom and Asian-American communities for not even bothering to look for Asian leads. Despite this, other major adaptations of Japanese works are on the horizon, such as Your Name (君の名は, kimi no na wa), last year's breakthrough animated movie that became the fourth highest grossing film of all time in Japan. At The Mary Sue, Princess Weekes wonders how Hollywood is going to handle not just the casting, but the story, which is intricately tied to Japanese mythology and interwoven with Shinto religious practice. Sadly, given recent history, the answer is shaping up to be: not well. Not well at all. I watched a few episodes, and plan to watch the rest soon, as I find it both perplexing and intriguing. The show plays with traditional dramatic narrative structures by melding a traditional, linear narrative with a psychological, dream-like one that takes place, over the span of several episodes, entirely in the protagonists' heads. It can be hard to follow at times, and requires a skill most American television viewers long ago abandoned: concentration. It's funky and experimental and fun to watch. But I was most surprised to see Maniac do something I haven't seen done effectively since Big Hero 6: It melds US and Japanese culture in an intriguing, non-derogatory way. In Big Hero 6, this took the form of San Fransokyo, a version of San Francisco that emerged (in the writers' imagination) from the ruins of the 1906 earthquake. Maniac doesn't seem to have an overarching narrative behind its esthetic (at least, not as far as I can tell five episodes in), but it comes across as a highly technological society that, design-wise, is still stuck in the 1970s. A Japanese esthetic dominates, and in the Japanese-controlled corporation where much of the series' dramatic progression occurs, Japanese language signage can be found adorning the walls. 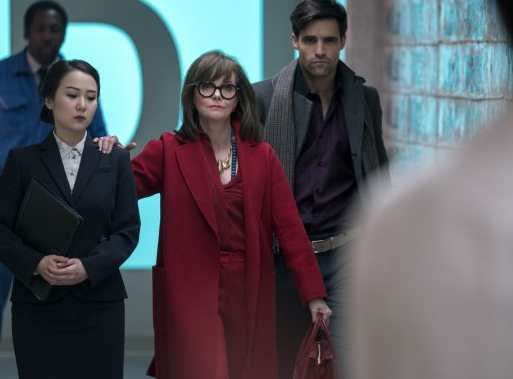 Many of the senior staff working for the corporation are Japanese, and feature actors of Japanese heritage, including Japanese-British actress Sonoya Mizuno, and Rome Kanda, a Japanese comedian who lives and works in the US. The writing on the wall reads, "Destiny can be changed" (運命は変えられます). Of course, I'd be remiss not to note director Cary Joji Fukunaga, the lauded director of True Detective, and the son of a third-generation Japanese-American father. I have no first-hand knowledge of the mechanics behind the scenes, but I can't help to think that Fukunaga's heritage led him to fight for this unique vision, and to get significant screen time for several gifted Asian and Asian-American actors. With all that said, this is still typical Hollywood: a show that, no matter its Japanese influence, is still helmed by two white stars - Emma Stone and Jonah Hill. This isn't a knock against Stone or Hill, who give excellent performances. In particular, Hill is fascinating to watch as Owen Milgrim, a tender, damaged soul who's cursed with one of the most rapacious and backstabbing families this side of the Sopranos. He's even more fun to watch as Milgrim and his partner-in-crisis, Annie Landsberg (Stone), enter a psychological dreamscape where they inhabit the lives of characters who range across the social spectrum. I hope Hill continues to seek out meaty roles like this in the future, because he's a joy to watch. It's great to see a cast include more than a token representation of Asian actors. But when will we see more shows and movies like Asians that aren't afraid to let Asian leads hog the limelight? Sadly, I think this might be a battle my grandkids' generation find themselves still fighting. Japanese hit director Kore-eda Hirokazu's latest isn't scheduled for US release until later this year, but you can see some of his previous stellar work now from the comfort of your own home. How comedy and the concept of laughter in Japan evolved from seriousness to silliness. How do you boost sales of an instant noodle product that's been around for 60 years? Nissin found a way.